Use this interactive widget to see a step-by-step explanation of long multiplication. This is a randomly generated long-multiplication sum. 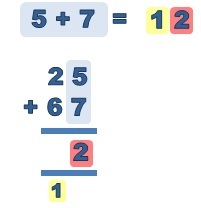 See similar widgets on long addition, long subtraction, and long division. 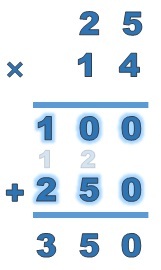 Long multiplication is a method for multiplying numbers. 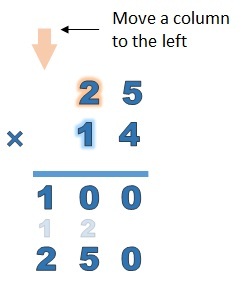 Long multiplication involves writing the numbers to be multiplied one underneath another, so the digits are in columns. Many numbers of any length can be multiplied in this way. 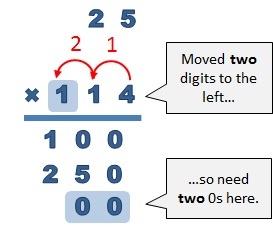 Doing long multiplication is easy. 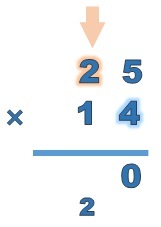 Write the numbers you wish to multiply, one underneath the other. 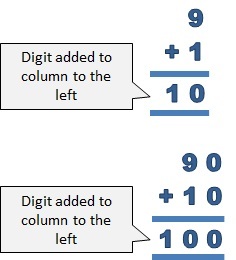 Find the right most digit of the bottom number (in the units column). Find the right most digit of the top number (in the units column). 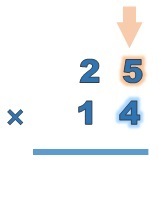 Multiply the bottom digit (4) with the top digit (5). No. 20 is not 9 or less. 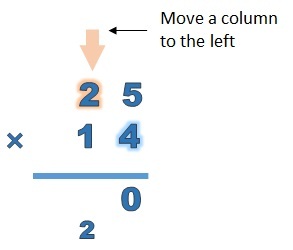 Write the digit on the right underneath the column (beneath the line). 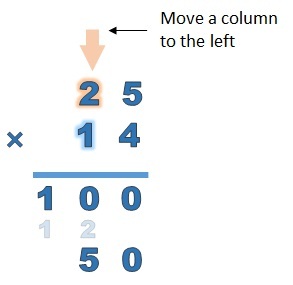 Carry the left digit to the column to the left. Move a digit to the left in the top number. 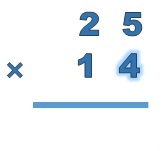 Multiply the bottom digit (4) with the top digit (2). Add any carried numbers to the answer. No. 10 is not 9 or less. There are no more digits to the left. Write the carried digit underneath the line. Write a 0 on the right in a new row underneath the line. 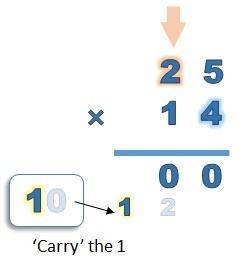 Move a digit to the left in the bottom number (in the tens column). 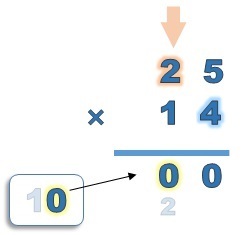 Multiply the bottom digit (1) with the top digit (5). If Yes, write the number beneath the line, to the left of the 0. 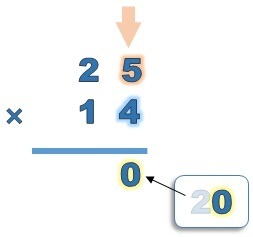 Multiply the bottom digit (1) with the top digit (2). Yes. 2 is 9 or less. If Yes, write the number below beneath the line. 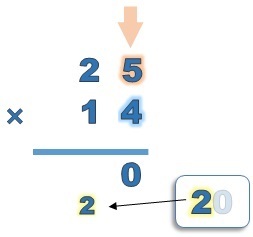 Use long addition to add the two numbers beneath the line. The solution to 25 × 14 is 350. 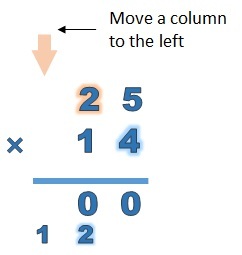 The slider below shows another real example of how to do long multiplication. 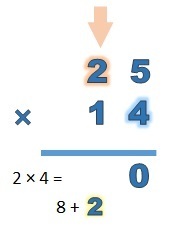 How to multiply How to do long addition What is place value? 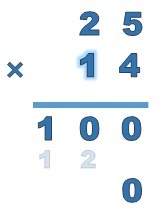 The numbers you multiply together are factors. 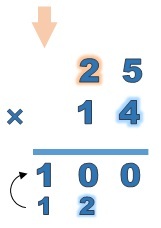 The result of multiplying the numbers is the product. 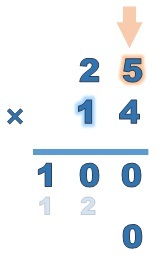 The order in which numbers are multiplied does not matter. 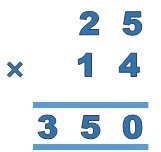 This is the commutative property of multiplication - changing the order does not change the result. 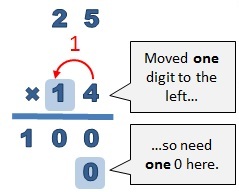 Long multiplication relies on place value. 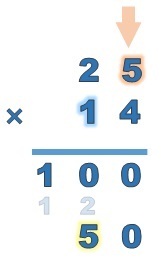 The digits of the top number are multiplied by digits of the bottom number. 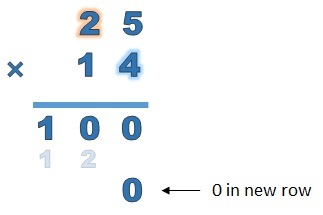 The right-most digit of the bottom number is used first, then one to the left, then the next left. 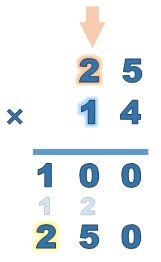 Because of place value, each digit to the left is 10 times bigger than the digit to its right. 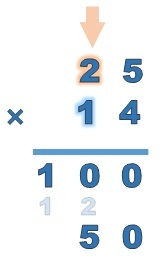 When the digit to the left of the bottom number is used, each answer will be 10 times bigger than the answers generated by the right-most digit of the bottom number.